The value of a Centennial, 1867-1967 - 5 cents 1967 stamp depends on several factors such as quality and wear, supply and demand, rarity, finish and more. Values in the section are based on the market, trends, auctions and recognized books, publications and catalogs. This section also includes information on errors and varieties and characteristics. The 100th year of Canada as a nation was celebrated by issuance of this commemorative stamp. 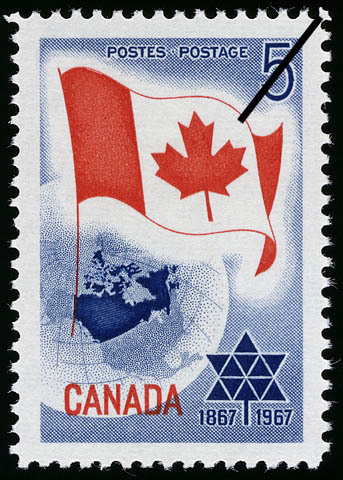 In keeping with the importance of the event conmmemorated in 1967, the stamp remained on sale throughout the Centennial Year as part of Canada's celebrations. Symbolizing the people's world outloook, the stamp depicts the globe whereon the geographic land mass of Canada comprising 3,560,238 square miles is emphasized in bold blue. Matching in colour is the national Centennial symbol at the lower right; superimposed on the design is the red and white national flag. Canada came into being a nation in 1867 by proclamation of the British North America Act to which Royal Assent had been given in England by Her Majesty Queen Victoria on the 29th March 1967. The first of July in 1967, an annual holiday, celebration, was the 100th anniversary of the official attainment of nationhood. Baron Monck of Ballytrammon, a native of Tipperary, Ireland, represented the Sovereign as first Governor General of Canada. He had previously been an enthusiastic supporter of Confederation while serving from 1861 to 1867 as Governor General of British North America. Terms of Confederation to bring into being a new nation had been negotiated at the London Conference convened in England on the 4th December 1866. Attending were 6 delegates from Canada and 5 each from Nova Scotia and New Brunswick. John Alexander Macdonald was Chairman. He was later to be knighted for his work in bringing Canada to nationhood and he was the first Prime Minister of the new nation. Confederation in 1867 resulted in the federal union of Upper Canada (Ontario), Lower Canada (Qu�bec), New Brunswick and Nova Scotia. The concept of a united Canada quickly spread from the Atlantic Ocean to the Pacific Ocean with successive admissions resulting in today's 10 provinces and 3 territories. Most recent addition province was Newfoundland whose entry into Confederation was on the 31st March 1949. The Centennial Stamp have on the reverse side a virtually invisible adhesive which was successfully tested on the 1966 Highway Safety commemorative issue. Because this stamp remained on sale for an extended period of time, quantities were produced tagged for use in the sefacan installation, Winnipeg, Manitoba. Tagged stamps are overprinted with a special coating to activate sefacan equipment. The design for this stamp was executed by Brigdens Limited, Toronto, Ontario; it is reproduced by the steel line intaglio engraving process by Canadian Bank Note Co. Ltd., Ottawa.